BlueSky Installations present our range of Attic / Loft Ladders. Every home needs a place to store seasonal and rarely used belongings; Christmas trees, suitcases, sports equipment, and keep-sakes for example. The attic space makes a perfect place for storage. The problem is gaining access to the attic in a safe and convenient manner. Traditional step ladders are cumbersome and rarely at hand. 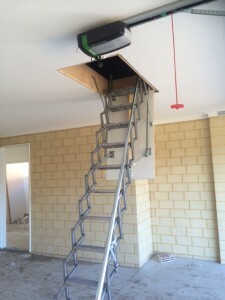 How convenient would it be to have roof hatch ladders always at the ready! Attic Ladders can be simply folded away when not in use and easily unfolded when required in 3 simple steps. Available with timber or aluminium stair, Bluesky’s attic ladders will suit almost any ceiling height to suit domestic, commercial or industrial applications.